The weather is a tricky thing. If you’re using a combination of weather apps and services to try to keep up with all of the latest developments and current temperatures, relax a little! 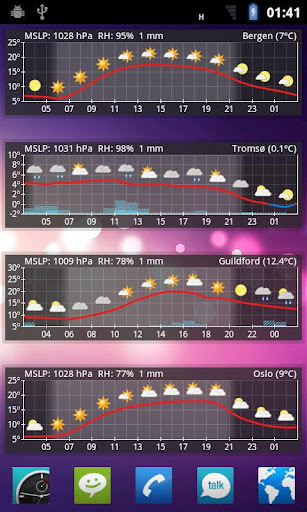 Instead of using advanced real-time charts and graphs, just glance at the whole day’s weather with Aix Weather Widget, a simple 24-hour weather widget. Aix Weather Widget is quite simple. 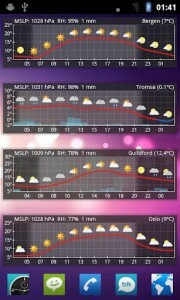 As you can see to the right, it displays the next 24 hours worth of weather in a nice little widget. You’re given temperature, precipitation, and expected cloud coverage, so there’s nothing missing. As the weather data is taken from the Norwegian Meteorological Institute and the NOAA, data is most accurate in Europe and the United States. It’d certainly be cool if Aix expanded to allow multiple weather prediction time periods, such as 5-day and perhaps even 10-day. However, on even just 24-hour, it does a great job keeping you up with the latest in weather trends and well protected from the elements.